Here is a geometric assembly challenge which you can try to make with wooden dowels or any other conveniently long cylinders. Each of these thirty aluminum rods touches ten others. 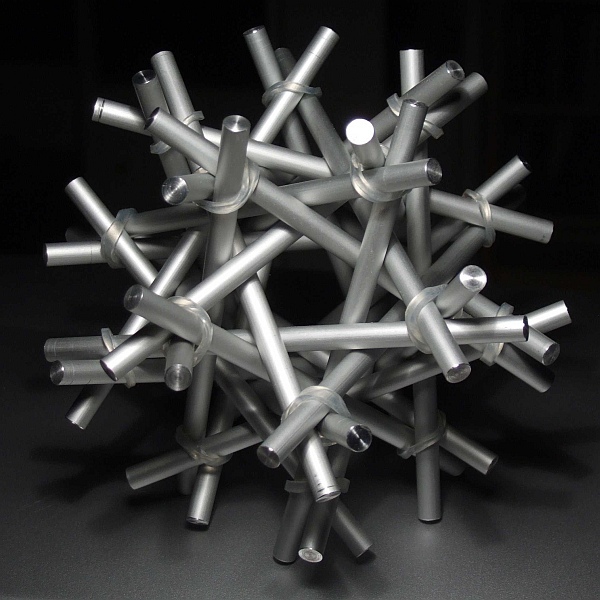 The construction is rather tricky to accomplish even if you properly understand it as a compound of five interlocked tetrahedra. The rubber bands join the sticks into five groups of six, each a regular tetrahedron. The five tetrahedra stay together in a mass because of the way they are interwoven. If you manage to build your own copy, you’ll see it is very solid and it will look quite cool on your desk because of its symmetric regularity. But it is tricky to build because when it is partially complete, it is hard to know where to leave space for the remaining pieces. Rolando Pontalti, of Trento, Italy, made this metal model and also made the pencils and O-rings version below. 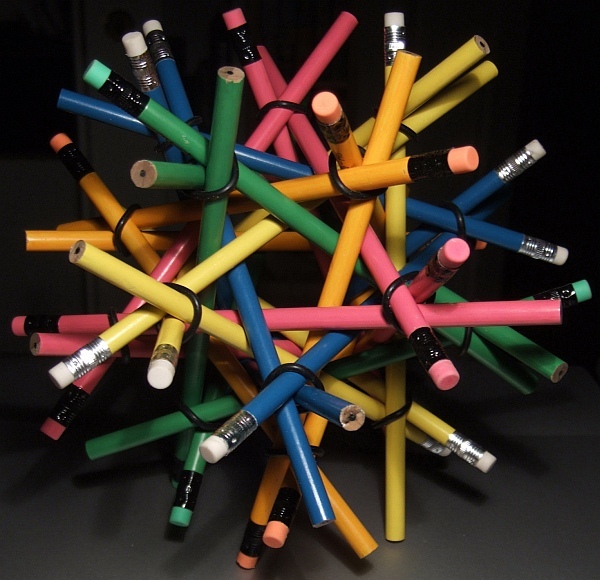 With pencils, five colors can be used to emphasize how the sticks are grouped into five tetrahedra. But the presence of erasers on just half of the ends means some symmetry must be lost. This article first appeared on Make: Online, January 24, 2011.